A Warrior, his wings and the wind that lifted him - Chris Morgan, 311th FG flies west. The stories of the hugely successful people I get to interview can't be ranked in terms of quality or importance. But, when asked the question, "Who's the greatest person you've ever met?" Chris Morgan is...top 10? Top 5? I don't know and can't say anything other than, "Chris is up there." But, long, long ago, you'd have never bet on it. Chris Morgan, c.1943 at Advanced Training. Love the scarf! Here's the back story. 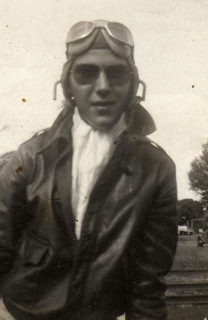 Chris Morgan was born in 1923, in Whitestone (Queens), New York, and grew up a normal, Depression-era kid, developing a love for airplanes. Like most who get bit by the flying bug, it was at an airport, where he beheld one of the famous "Gee Bee" racers of the 1930s. When the winds of war blew onto the U.S. in 1941, Chris responded by joining the Army Air Force in the hopes of becoming a pilot. Chris made the grade—top grade, in fact, at least if you consider that fighter pilots were/are the pinnacle of an aviator's ambition. 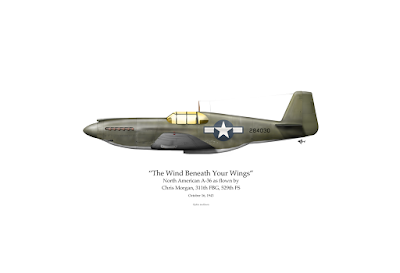 Assigned to the 311th Fighter Group, Chris's mission was to provide air cover and tactical services against the Japanese forces in China/Burma/India (CBI). The 311th's efforts are rather storied. 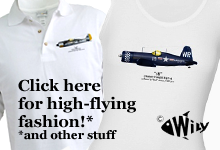 You can read about one particular pilot, Bill Creech, by clicking here. But one really needs to appreciate that the CBI was a hell hole. The terrain was vast, extreme (Mt. Everest to Burmese jungle to Chinese desert in one hour by air!) and the fighting, a bewildering campaign that was more like the guerrilla warfare of Vietnam than the cinematic sweeps of Europe or the Pacific. Yet, on October 16, 1943, Chris Morgan took off from the USAAF airbase at Dinjan, India on his first combat mission—a Flight of four A-36s, armed with bombs to not only inaugurate the Group's presence but neuter a Japanese Army HQ, located in the Burmese village of Sumprabum. I'll be blunt—Chris's Flight Leader screwed up and got the Flight lost. One member of the fated four took matters into his own hands and broke formation to find his way home on his own (which he did). But the other three did not. They belly-landed their precious planes onto a rice paddy smack dab in enemy-controlled land. Though the three certainly tried, they were unable to evade capture. In three days, the pilots were suffering under the words, shouts, fists, rifle butts and swords of the Japanese Army. Chris was now a POW of the most brutal captors of WWII. 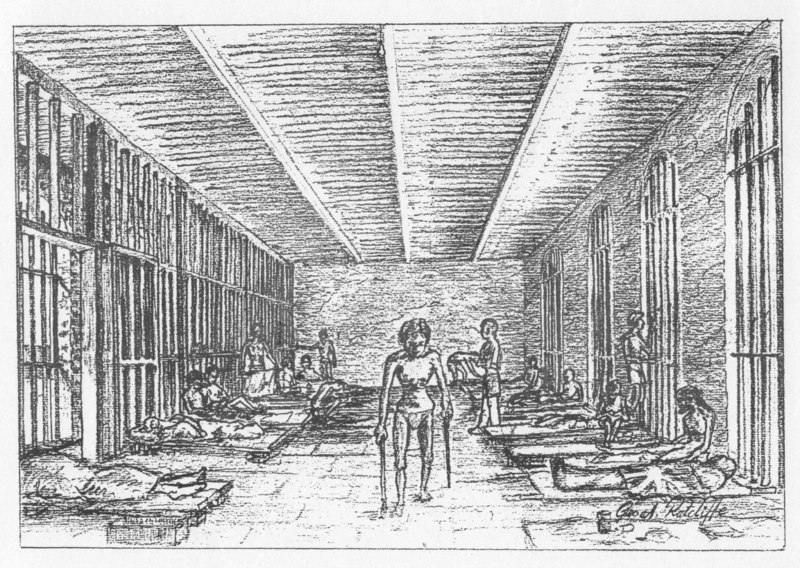 A drawing of the Japanese POW camp in Rangoon by a British survivor named Ratcliffe. That's all I know. Factoid: depending upon your source and arithmetic, American POWs of Germany experienced about a 3% fatality rate while in captivity. Under the Japanese, that number was about 40%. In this case, that means the Japanese were 10x worse than the Nazis. Did you ever read Laura Hillenbrand's book, Unbroken about Louis Zemperini? Louis's story of survival under the brutality of the Japanese prison system is legendary. Zemperini's story of triumph is also certainly awesome (repeat). But to be fair, Louis was but one story of the many who endured same. Chris experienced torture, brutality, disease and the death of his friends. Add to this, the ignominy of never actually getting to do the vaunted job you aspired to do, because of another man's incompetence...each painful, broken day was true injustice. Repatriated in May of 1945, Chris was nursed back to health in the American tradition of showers, shaves, lots of food, beer...and a pat on the back before being shown the door. Generally, this pull-yourself-up style of rehab can work, if not perfectly, as (at least) it can show some results. It's amazing how the body can bounce back; Chris went from his 100lb skin/bone frame to back to 160 fighting weight in a blink. Within 45 days, he looked good enough to start the war-bond circuit. But body is one thing, soul is another. For that, he was left with the impossible task of healing himself. Chris, in his own words, became a failure. 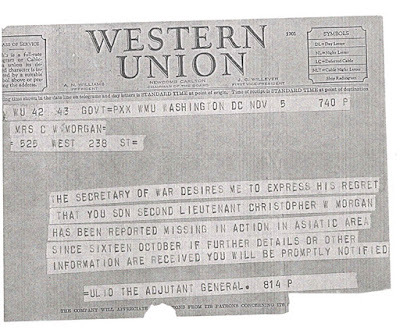 The telegram announcing Chris's captivity. Gawd, it's cold, don't you think? But to be fair, just how do you write these anyway?! In the end, I think they're written as well as possible. "Who wants to be defined as a prisoner? 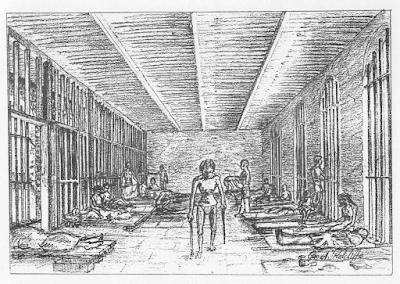 Of a Japanese prison camp?" Chris stated to me in his uppuh-east-cowst accent. "But it's my life. For a long time, it didn't work for me. I hated it." "I drank. Wasn't...the kind of man I should have been. Why does it matter (to you) now?" Chris, from the film "Wind Beneath Your Wings"—we had to get a scene in where he was steepling his fingers; he spoke with his hands as much as with his voice. I had to collect my thoughts. I'd learned that talking with Chris Morgan was never superficial; people who've walked through the valley of the shadow of death (and made it out the other side) have massive mojo. They're quietly fearless and loath wasting time. The pressure was on; Chris's question was not rhetorical. It was personal and if the conversation was going to go anywhere, I had to answer. "Well...because you obviously figured out how to deal with it." PTSD, regardless how you define it, is real. It's a hollywood movie of an uninvited psychopath that suddenly shows up at your door, eats your food, ruins your house, steals your stuff and never leaves. Chris lost his education, ambition, friendships...and the ability to stop drinking after one, two, five...ten. The more PTSD took, the more Chris lost. "How long did it take you to get past all that?!" I asked with more-than-a-hint of exasperation. I remember Chris's answer; he raised one eyebrow. Five, maybe ten seconds later, he spoke, "I lost my best friend when Connie died*." 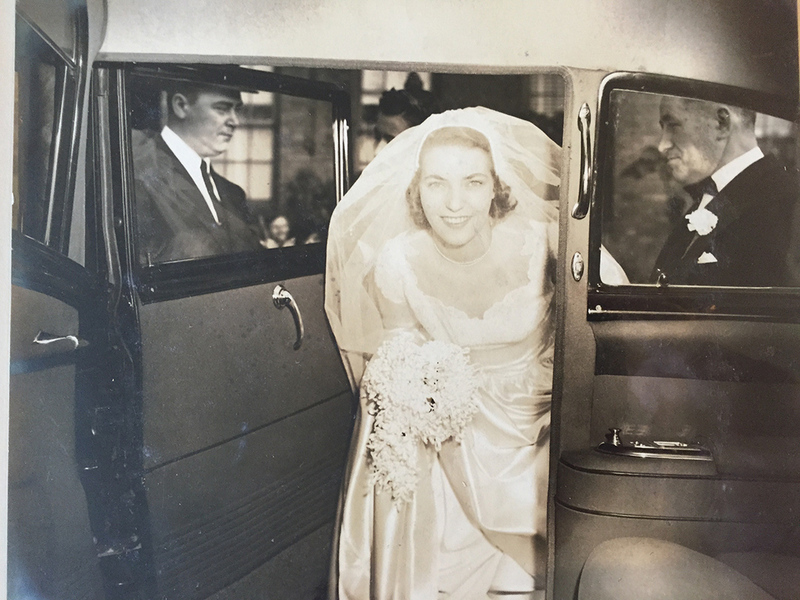 Connie was Chris's wife and, "the best thing I evuh done." It was through Connie's care that he overcame alcoholism, rewired himself for the future and rebuilt a life of family, career and self-respect. 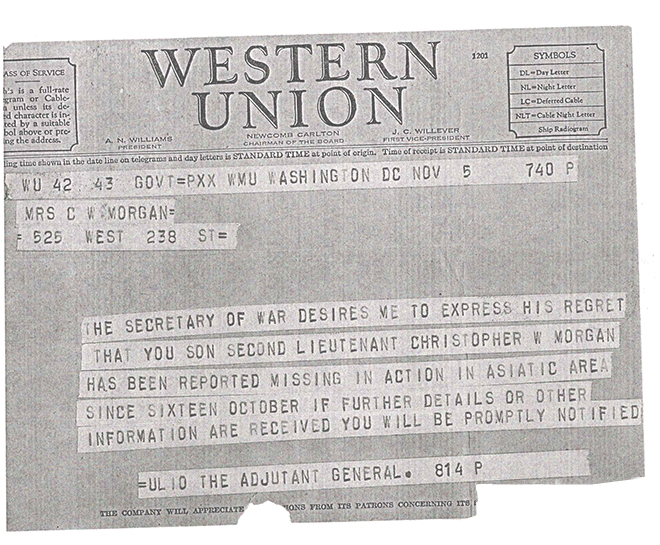 Yet, when the Vietnam War erupted, Chris Morgan paid-it-forward to become a nationally renown voice for the POW movement, working in a myriad of ways for ex-POW care, respect and fair treatment once they returned home. 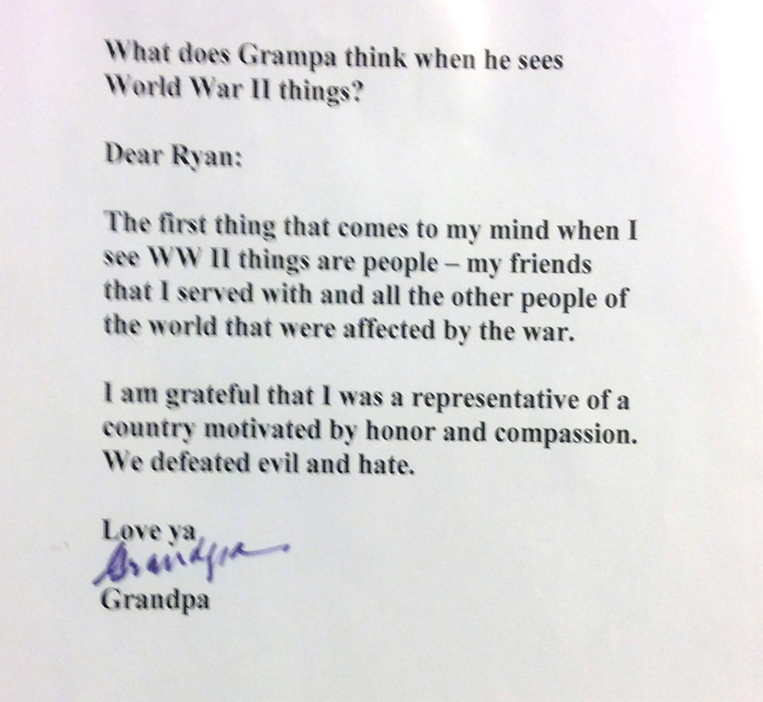 The Morgan family let me take pictures of Chris's replies to letters that his grandchildren wrote. 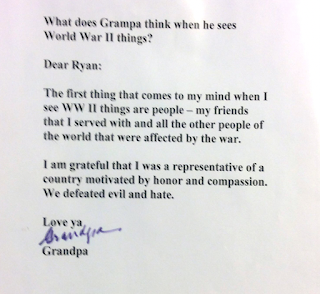 This is a great response to Ryan's question...which was a great question to begin with! You must know that 'all this' was not done with the slightest bit of self promotion or fiery indignation. The only fuel Chris required was that of gratitude—for the love of a woman that could see his potential and his place in a country that allowed him to reclaim it. No place in Chris's small apartment was more hallowed than the space that held Connie's photo. The reason he let me create a film about his life was that I recognized the importance of that lovely woman in the Morgan family's life. And of those years of captivity, torture and failure? 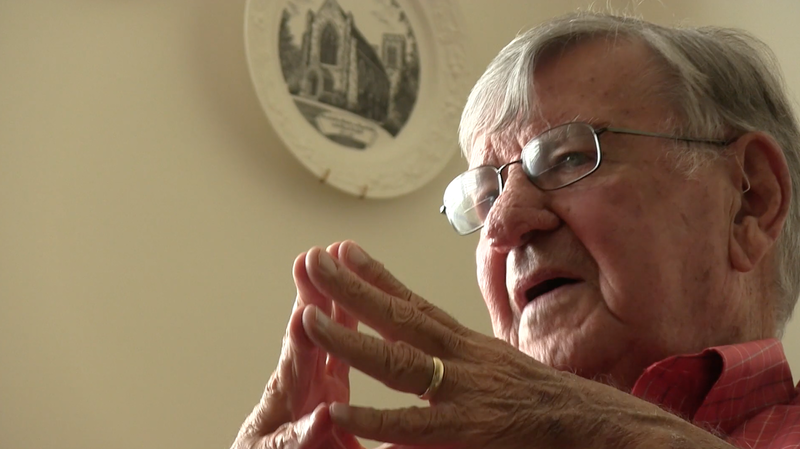 He released any grudge against the government that didn't quite know what to do with POWs. Of the other government that sanctioned his torture? He forgave them on the grounds that he himself knew what it was like to live in ignorance. 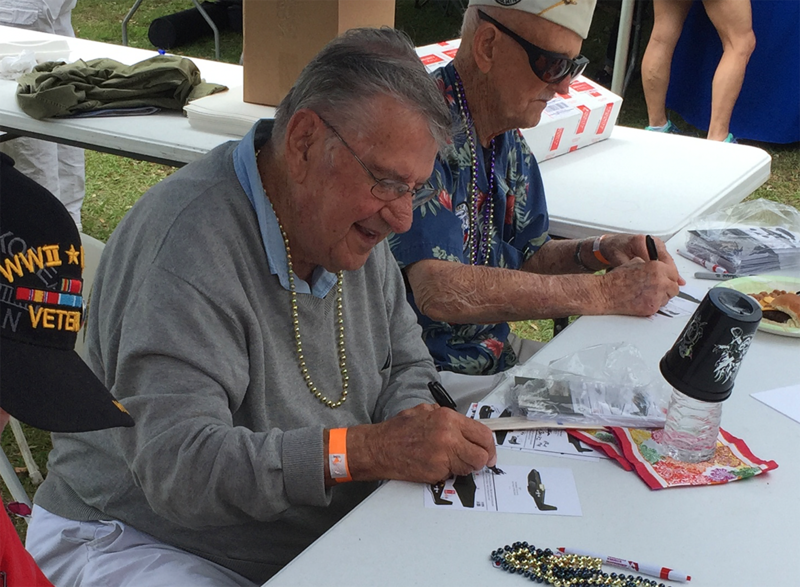 The Fort Walton Beach Chamber of Commerce hosted a deal where mil-vets were honored. Chris sat at a table with Corsair pilot Red James and PBM pilot Cass Phillips—the three signed autographs on little cut-out replicas of the airplanes they flew. It was supremely cool to see the LINES of people waiting to meet and thank these completely great warriors. I have a memory of Chris that will always persist—we were at a ceremony together and when the American anthem began, I looked over at this 90+ year old man, standing as tall as when he was 20. And then, he sang the words, loudly, in that accent...and I remember, "That, is the voice of gratitude." Today, March 4, 2018, Chris Morgan Flew West. Don't feel compelled to watch OGTA episode, "The Wind Beneath My Wings." Be advised it's nearly a half hour, it moves at Chris Morgan's desired pace (i.e. steady, thoughtful). But if you do, recognize that it's not a story about the pain of captivity. It's a story about the freedom of Love. *So sad to see you go, Chris...but do tell your beautiful bride hello. There are many that would love to meet her, too.